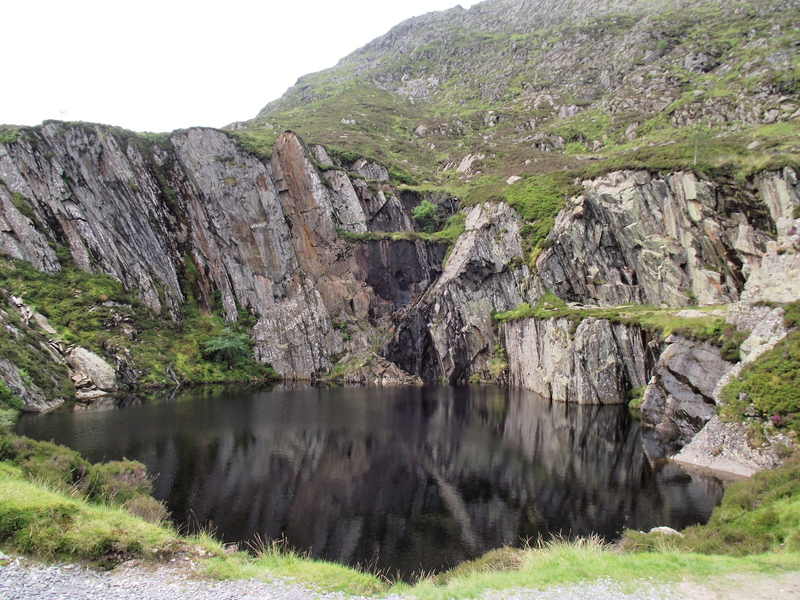 ← #87 – Cwm Idwal … The morning after!! You can see Moel Siabod (the ‘Shapely Hill’) from our house. 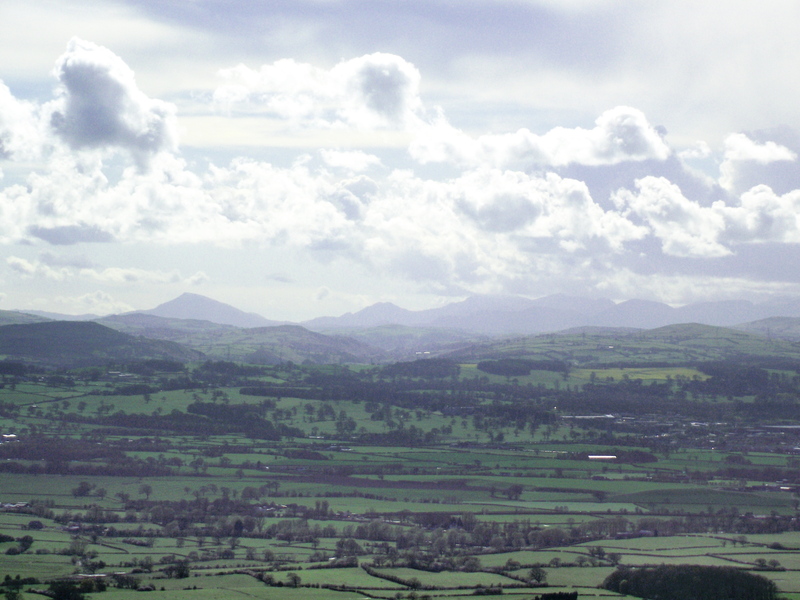 Well, not strictly true … you would see Moel Siabod if our own shapely hill of Moel Hiraddug wasn’t in the way! (See Post #73) So, it’s dog-walking boots on and up the hill, with a Border Collie running nose into the wind, sniffing out things we aren’t even aware of. 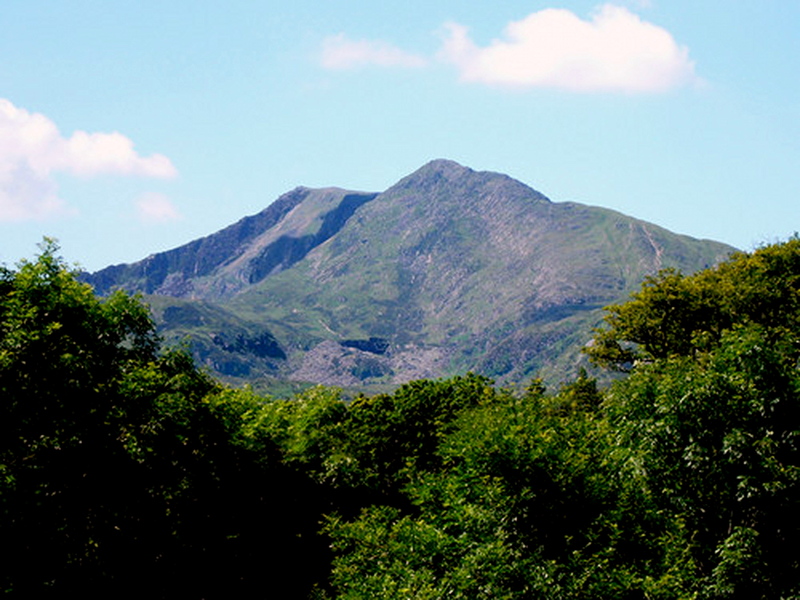 As we come to the crest of Moel Hiraddug, the Snowdon hills stand proud about 40 kilometres (25 miles) away. 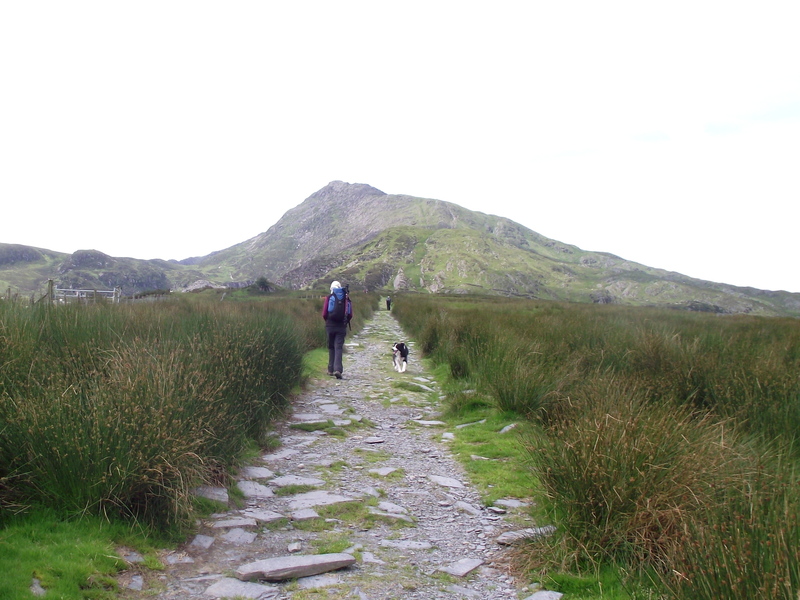 Alone on the left is Moel Siabod. 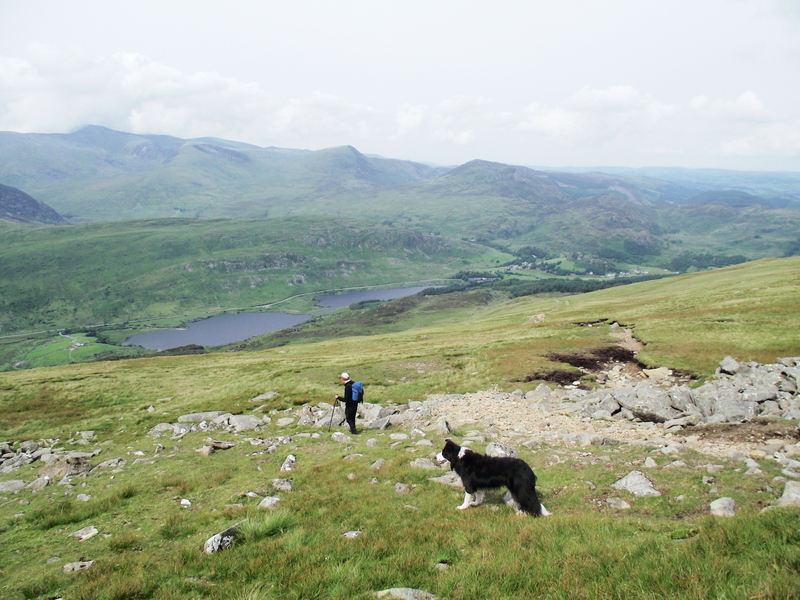 Some friends of ours walked up Moel Siabod a couple of years ago – they said it was one of their worst hill days ever! I can guess the way they came down – a descent down a steep, rocky gully that turns into a steep wet gully. It’s not too bad really, but I knew that Chris wouldn’t talk to me for a week if I took us down that way, so when I suggested the ‘Shapely Hill’ as a walk I already had a plan ready. 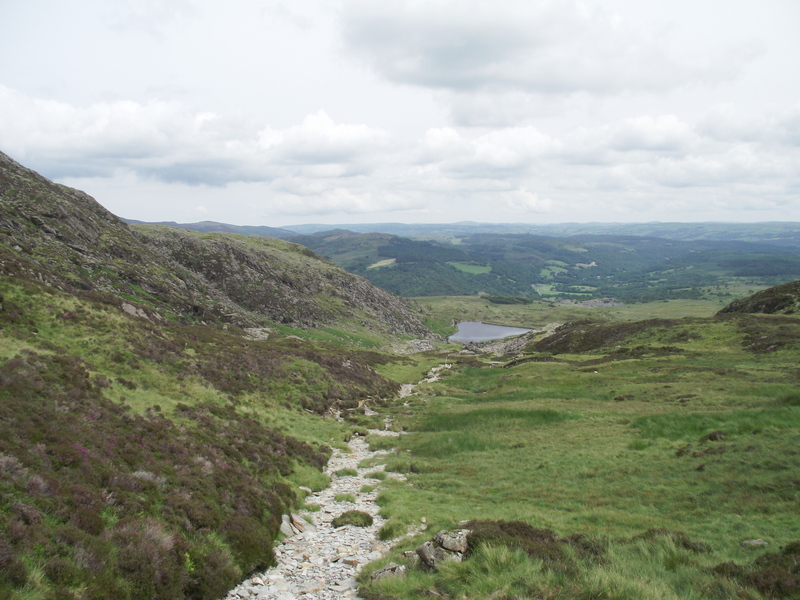 The plan went something like this – Moel Siabod is a rocky ridge about 800 metres long. Ascents or descents at the northeast or southwest ends of the ridge are steep, and the more gradual approach from Plas y Brenin is a bit of a slog. There is, however, a kinder and more interesting alternative. 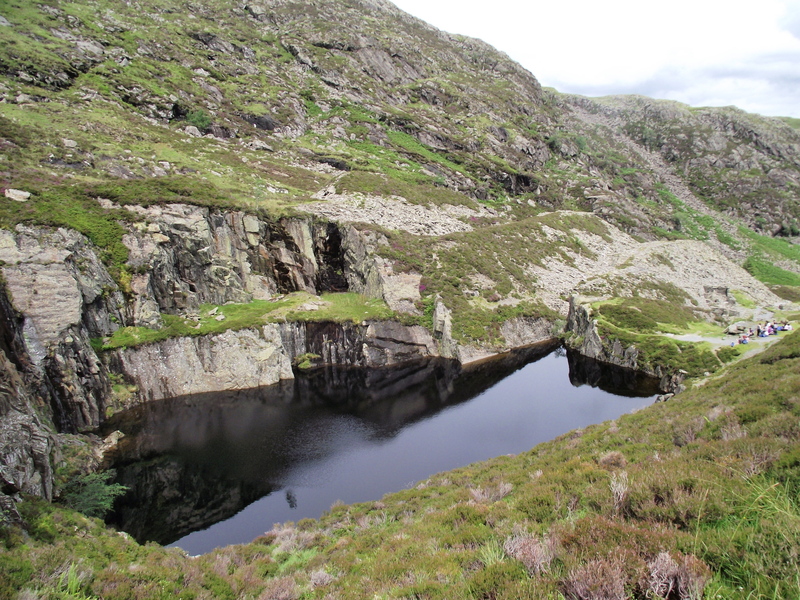 An old quarry track from Pont Cyfyng at Capel Curig gives good access to Llyn y Foel (the ‘Mountain Lake’), and from there a ridge heads up and west, aiming directly for the summit. The old quarry track gave us easy walking to the old quarry, where there’s a dramatic water feature, but it’s a bit too big to go in your back garden. As we walked, we were in danger of playing leap frog with a bunch of youngsters from an outdoor centre, but they stopped for lunch at the flooded quarry, and we slipped in a crafty overtake. Beyond the quarry the track became a path, narrower and steeper than the track, but still easy going. 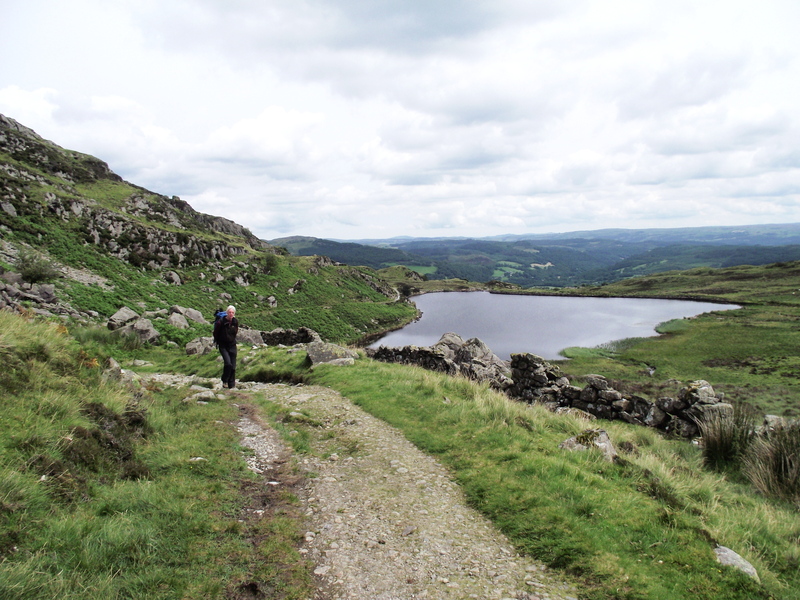 We were soon at the lonely little lake called Llyn y Foel, with our route lying just beyond, the Daear Ddu Ridge. 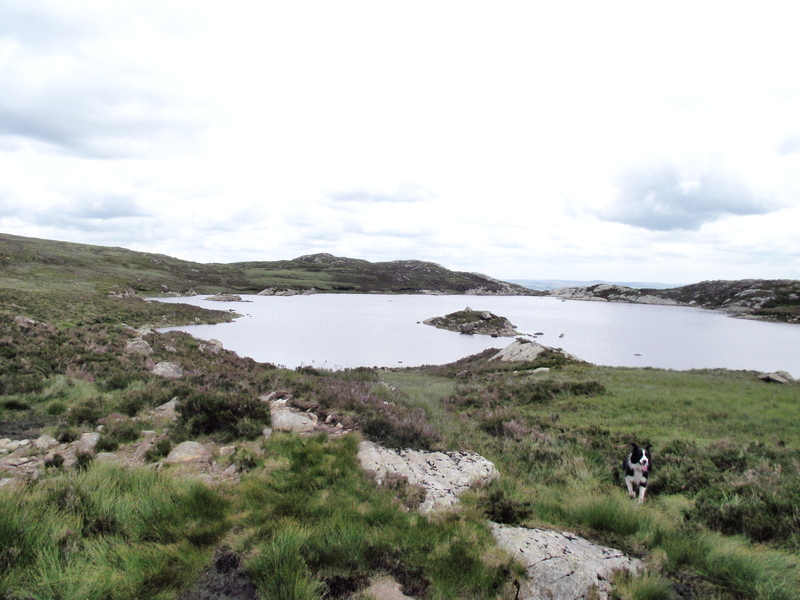 To get there we had to cross boggy ground around the lake. Chris neatly sidestepped the knee-deep bit of bog that I hadn’t noticed, and I ended up with a bootful of mud! ‘Mist’ is a mud magnet at the best of times, but her tactic of charging flat-out across the boggy bits seemed to work for her. 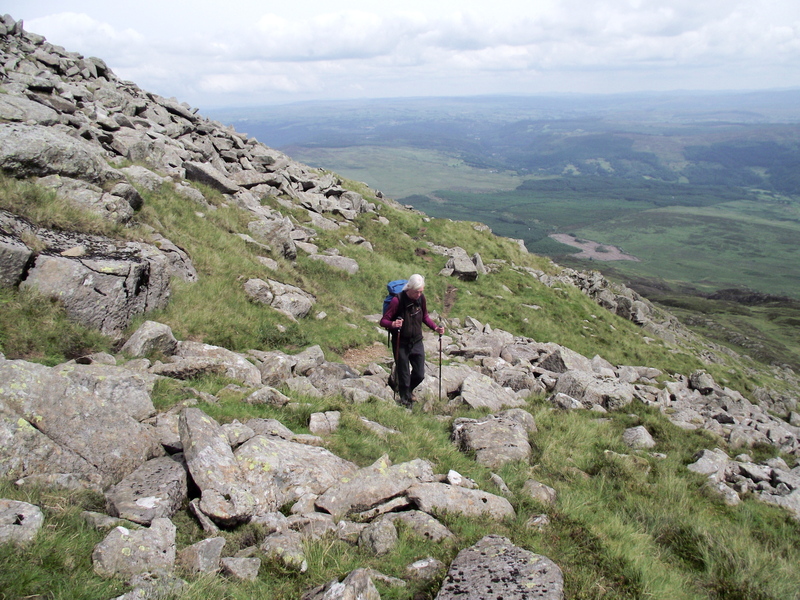 There are two options on the ridge – stay on the right edge for an easy Grade 1 scramble or follow a path to the left to avoid the rocky bits. 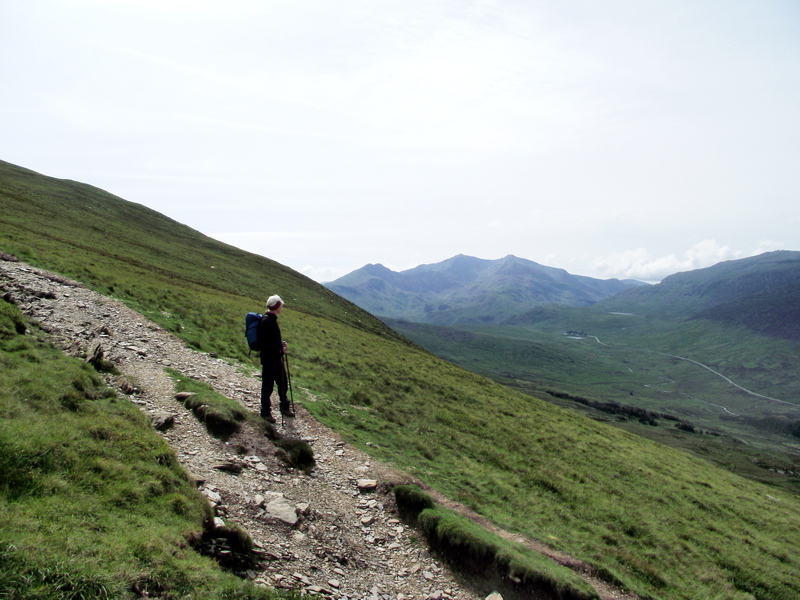 The scramble is easy and difficulties can be avoided, but it would have taken extra time so we opted for the path. Whichever way is followed the route suddenly gets steep, packing most of the height gain into about 1 kilometre of distance. Then, all of a sudden, the route tops out on the summit ridge. 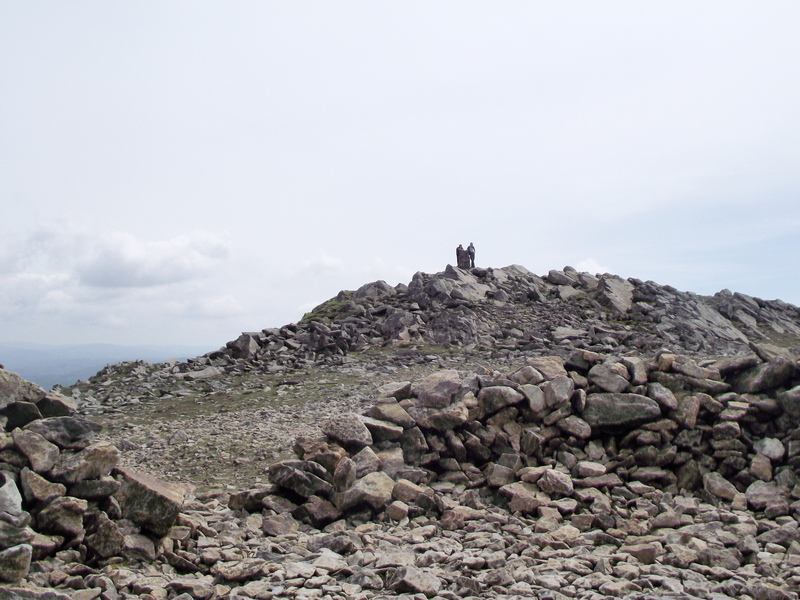 A stone built trig column marks the top, not far from a low shelter. 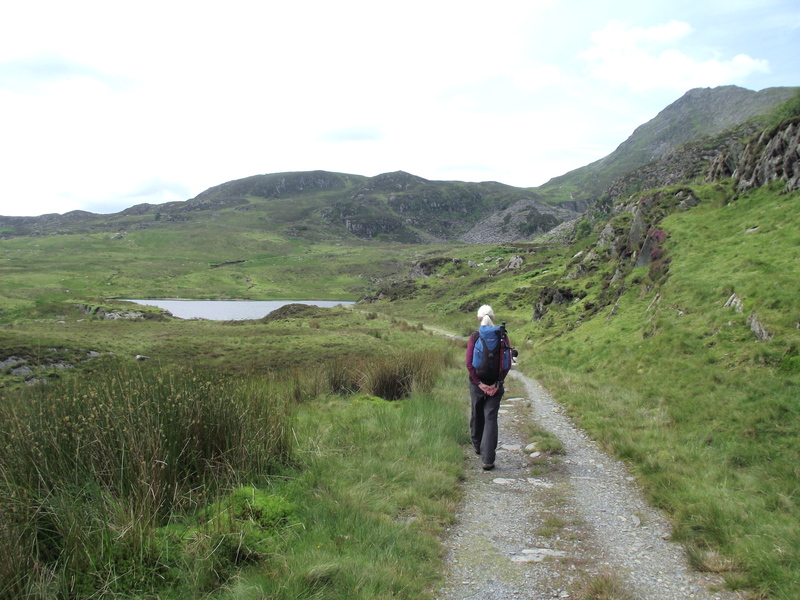 The views of Snowdonia are stunning, and we spent a few minutes identifying the surrounding peaks. From there it was all downhill – the path from Plas y Brenin might be a bit of a slog in the ascent, but going down it’s steady and pleasant. Once off the hill, it’s even easier walking through woods followed by forest trails. 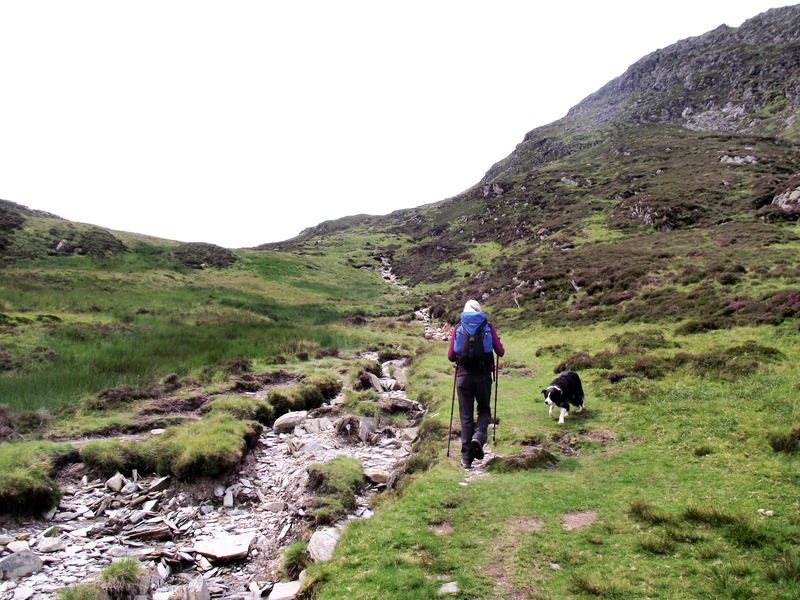 We followed the path above the river towards Pont Cyfyng, rather than walking alongside the busy A5 road. 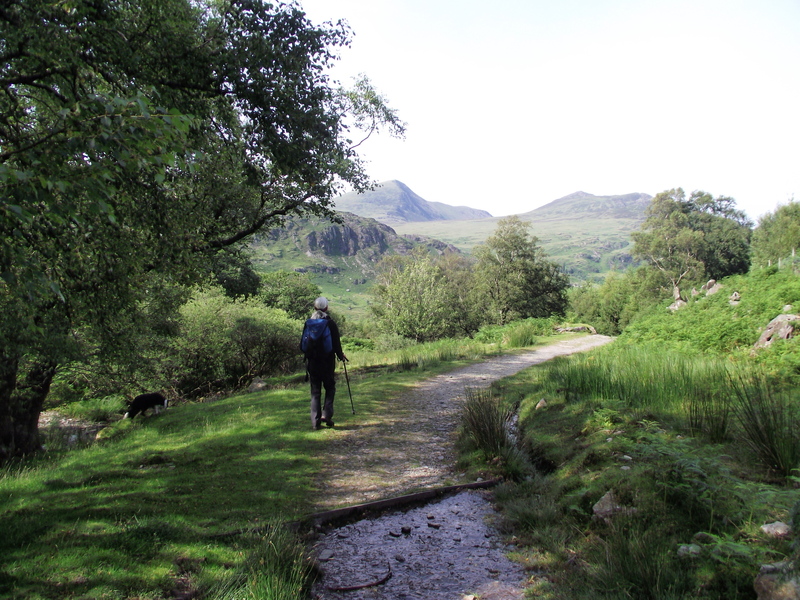 Chris hadn’t been on a high walk for several weeks, so I generously changed the route towards the end, leaving the rougher stony path to cross the river by a footbridge – the fact that Cobdens Hotel and bar were on the other side of the bridge had nothing to do with it …. Honestly …! This entry was posted in 5. 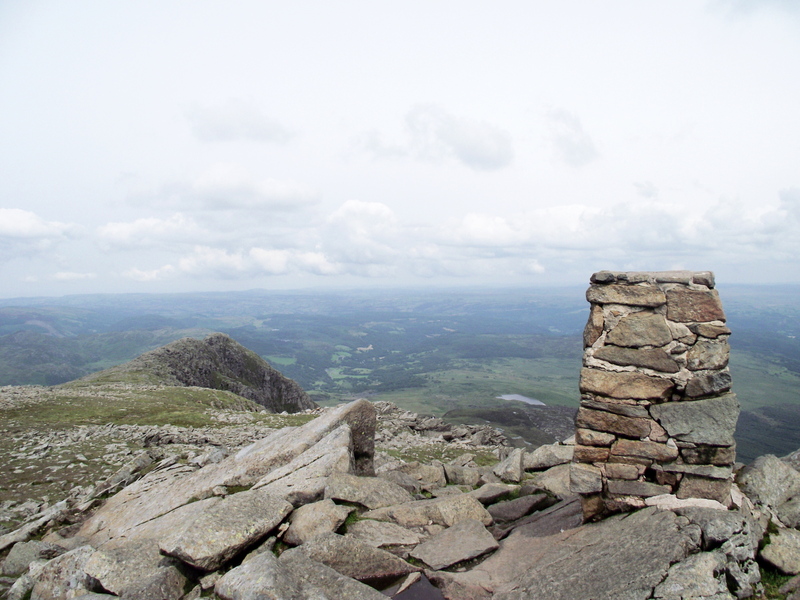 North Wales and tagged hillwalking, mountains, photography, scrambling, Snowdonia. Bookmark the permalink. One of my favourite mountains in Snowdonia. 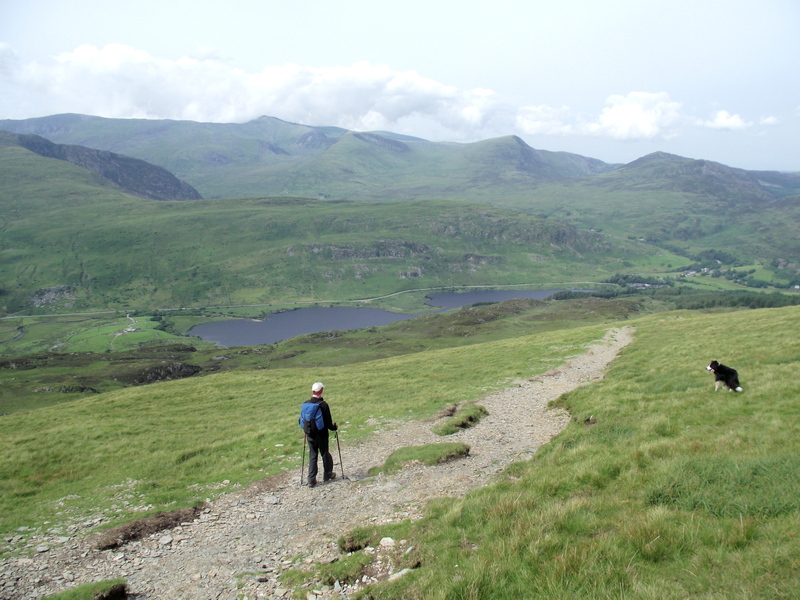 You get some great views of Snowdonia from a peak on the edge of the main mass. I’ve been up this route three times (I think) and it’s always been a pleasurable little scramble. Have you any experience of climbing it from the SSW or West? I’ve looked at the possibility of a long day over Cnicht, Ysgafell Wen, Carnedd y Cribau, or starting out from Pen y Gwyrd. I suspect there’s a lot of boggy ground in that area though. Some excellent images and well written, Paul. Brings back some happy memories. Thanks for the comments, Andy. The Ddaer Ddu ridge is my absolute favourite route up that hill (I thought it just meant bald hill by the way) – I love the scrambling up that ridge as, if you start finding it too hard or aren’t having a confident day (which I’m often not), you can just go left back onto the path and choose another bit higher up. I have done all the hard bits when I’ve been having a good day though and enjoyed them. 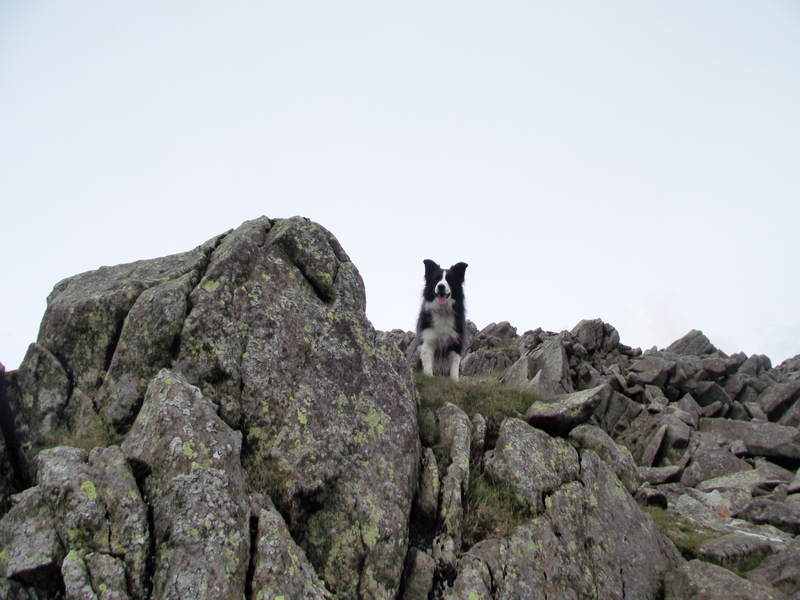 I like the walk round to the start of the ridge too – I keep hoping to get Richard on that hill and that ridge – he’d love it. 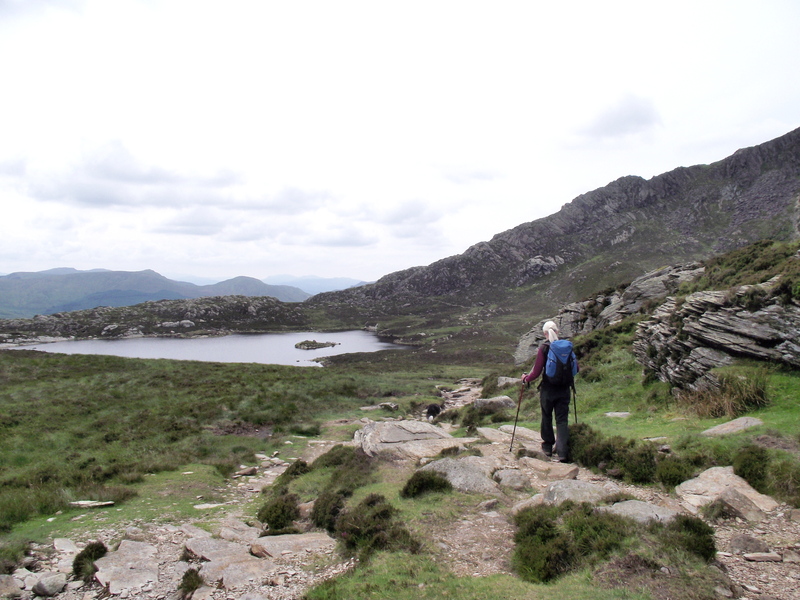 Thanks for the comment Carol – It’s certainly a great hill whichever way you take, but I agree that the Daear Ddu route is the tops! Lenscraper – I came down the way you said to the Pen y Gwyrd. It was one day when I was out with my mates Mark and Colin and we had 2 cars available. 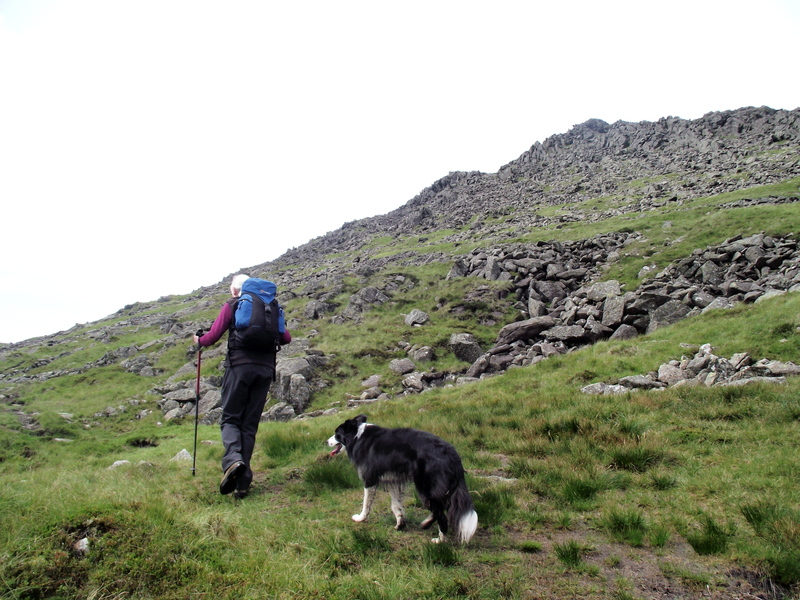 We went up the Ddaer Ddu ridge and then followed the long ridge back to Pen y Gwyrd. It made a really nice, long and gentle descent. It was a little bit boggy descending at the end and crossing the ground back to the hotel though. Apart from that there weren’t any problems.